To inquire about any of Mark's services and membership groups use this convenient contact form or get in touch by phone at the numbers below. 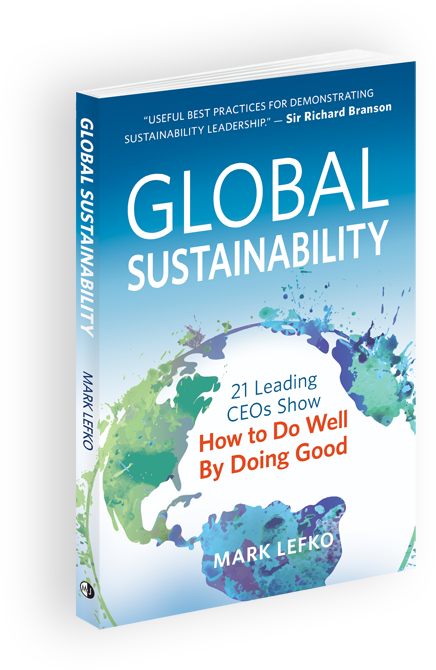 Featuring in-depth interviews of 21 leading CEOs, Mark Lefko’s book examines this vital subject from the perspective of today’s most influential business leaders. Available at Barnes & Noble and Amazon.com as well as many local bookstores. Employees who feel secure in their jobs, who feel respected and trusted, will go to surprising lengths to earn and keep their employers’ respect. In short, happy employees are more productive employees. Ask your colleagues to define what sustainability means and you’ll get a lot of responses related to environmental consciousness or “going green.” But that definition sells sustainability short. Giving back to the communities that supply your business with labor and raw materials isn’t just a matter of ethics or public relations; it’s a wise business practice. There's too much focus on short-term results in business today. Striking a balance between short-term earnings and long-term investments requires courage on the part of CEOs and business leaders. With C-suite experience in multiple industries, Mark brings the personal integrity and honesty you would expect from someone who has provided counsel to some of the top CEOs. Keynote topics range from sustainability and leadership to unlocking the power of your team. Mark's prevailing message of "do well while also doing good" is always commercially valuable. When companies focus on embracing sustainable practices that benefit people and the planet, they also help grow profits. Watch the video for an overview on sustainability leadership in today's world.